ENGLEWOOD CLIFFS, NJ, June 6, 2017—Men’s caring roles are evolving—today there are many different types of men who play instrumental roles in shaping and caring for others. That’s why this Father’s Day, Dove Men+Care will celebrate dads and all of the strong father figures who have been there to care, from grandfathers and uncles, to teachers and coaches. 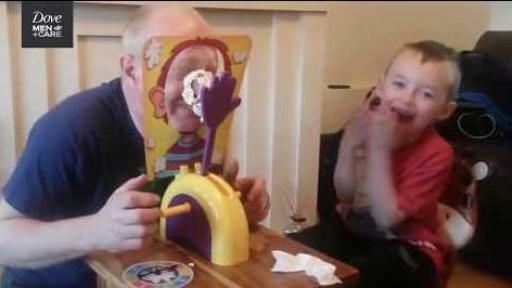 The clip shows Martin and his grandson Jayden sitting in the living room in his home town of Wishaw, Scotland where they’re spending quality time playing the game ‘Pie Face’ together. A fifth-grade teacher at Ashley Park Elementary in the Charlotte-Mecklenburg school district in North Carolina has a personalized handshake for each of his students, and he greets them with it at the start of each day. Anna Tarabilda’s son, Cohen, loves his uncle Scott, who would take time out from being with his friends in college to visit and spend time with his young nephew. As the head middle school football coach at Russellville Middle School, Coach Larry Gilmer treats each of his players and everyone in the community like family, regularly reminding them all how much he loves them. Visit www.DoveMenCare.com/Fathers-Day to watch the film ‘There to Care’, and join the conversation by sharing who was #ThereToCare for you by tagging @DoveMenCare on Facebook, Instagram or Twitter. Dove Men+Care knows that male strength today is about embracing care for oneself and others. 91 percent of men believe they need to take care of themselves in order to be able to take care of others1. Dove Men+Care has a full line of grooming products specifically designed to care for men’s skin, face, hair, and underarms. For more information, go to www.dovemencare.com. Dove Men+Care will also continue to demonstrate its commitment to dads from the very beginning through its “Dad Care Package” program for a third year. The program will equip dads with skin, face, hair and deodorant products, as well as Baby Dove Tip to Toe wash. This ensures that dads can have access to the tools they need to better take care of themselves and their new families during the busy and exciting journey of new parenthood. The care packages also feature a burp cloth and “welcome letter” with words of encouragement from real dads. In its third year, Dove Men+Care continues to expand its network of hospitals, distributing “Dad Care Packages” to 15,000 dads across the country.